Both Israel and Palestinian militants may have committed war crimes during the 2014 Israel-Gaza conflict, UN investigators have said. In a long-awaited report, the UN team said there was evidence of "serious violations" by both sides. Israel dismissed the investigation as "politically motivated and morally flawed", while Hamas said it wrongly equated "the victim and executioner". The conflict lasted for 50 days between July and August, and ended in a truce. On the Palestinian side, 2,251 people, of whom 1,462 were civilians, were killed, the report said. On the Israeli side, 67 soldiers were killed along with six civilians, it noted. Israel says it launched the offensive on Gaza to put an end to rocket fire and remove the threat of attacks by militants tunnelling under the border. The UN Human Rights Council (UNHRC) investigation was mired in controversy from early on. The head of the inquiry, William Schabas, quit part-way through amid Israeli allegations of bias, acknowledging he had previously done work for the Palestine Liberation Organisation (PLO). Israel had refused to co-operate with the investigation, which it said had drawn its conclusions in advance. In their 183-page report the commissioners highlight the impact on civilians on both sides. They criticise Israel for not revising its practice of air strikes as casualties mounted, question the type of weapons it used and the quality of warnings it gave to Palestinians to evacuate their neighbourhoods. They say that militants' indiscriminate firing of rockets and mortars at Israel seemed intended to spread terror among civilians. The UN report, which urges cooperation with the International Criminal Court (ICC), comes at a sensitive time. This week the Palestinians will make their first submission to the ICC, which is conducting its own preliminary investigation into alleged war crimes and crimes against humanity. This will include a chapter on the Gaza war. The UNHRC report said that while both Israelis and Palestinians were "profoundly shaken" by the summer war, in Gaza "the scale of the devastation was unprecedented". It said 551 Palestinian children were among the dead, with thousands more among the 11,231 Palestinians injured by Israeli action. Up to 1,600 people in Israel were also wounded by Palestinian strikes, it said. 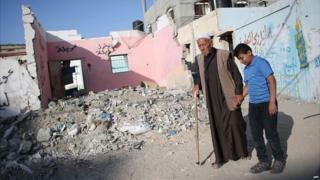 The report said Israel carried out more than 6,000 air strikes on Gaza, many of which hit residential buildings, damaging or destroying some 18,000 dwellings and much of Gaza's infrastructure. "There are strong indications that these attacks could be disproportionate, and therefore amount to a war crime," it said. The report said that while the Israel Defense Forces (IDF) said it took extensive measures to avoid civilian casualties, it "may not have done everything feasible to avoid or limit" these. The investigators also said Palestinian militants had fired more than 6,600 rockets or mortars at Israel, noting some armed groups had released statements indicating they intended to attack civilian targets. The report said the use of rockets and mortars by Palestinian militants, as well as the killings of alleged collaborators, also "may amount to a war crime". It called on Israel to "break with its recent lamentable track record in holding wrongdoers accountable", and said the Palestinian authorities had "consistently failed" to ensure that alleged perpetrators on its side were brought to justice. Israeli Prime Minister Benjamin Netanyahu condemned the report as "biased". "The committee that wrote this report was appointed by a committee that calls itself the Human Rights Council but in practice it does all but take care of human rights. "It is a committee that condemns Israel more than it condemns Iran, Syria, and North Korea combined," he said. Israel has carried out its own inquiry, which concluded its actions in Gaza were "legal" and "legitimate". For its part, Hamas, the Islamist militant group which controls Gaza, cautiously welcomed aspects of the report. "The report contains some positive paragraphs condemning the Israeli occupation, but it is equal between the victim and executioner," said senior Hamas official Ghazi Hamad. The commission said it had carried out more than 280 interviews and received more than 500 written pieces of evidence during its 11-month inquiry. It said Israel had refused to allow its team into the West Bank or Gaza, which made it difficult to carry out the investigation.